The brain is an organ, not to be confused with a Hammond Organ although a brain allows you to play a Hammond Organ it’s not an organ as in musical. It does like a bit of music too as long as its not a Hammond organ. With me so far? Good, we use our brain to control how you think, remember, feel and to make sure you keep everything in the toilet bowl using the ‘aim’ mechanism. 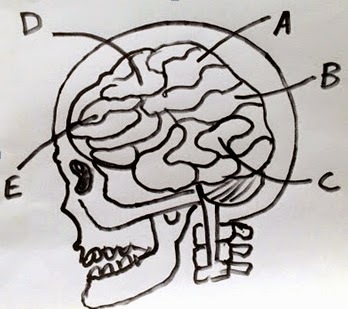 Section ‘A’ shown above controls the thought process when you want a cup of tea, the three layered tissue, called meninges, decides if you should have a biscuit with the tea or if you take sugar. People with blue eyes tend to have sugar whilst green eyed individuals prefer a biscuit. Biscuit preferring people are known in medical terms as Biscuitbrains whilst sugar people are called Sweetbrains, which one are you I wonder? Check your eyes in the mirror to find out. Brown eyed people prefer coffee, any other coloured eyes hint at a deep rooted problem with wine and vodka so be careful. Take a close look at ‘B’, this area controls vision so whilst you have just looked at it you have used your ‘B’. One interesting thing to note is that you have a zoom control, simply stick your right finger up your left nostril and twist. Clockwise will zoom in anticlockwise will zoom out, press your belly button to disable the ability to look up and down. ‘C’ helps you to make sense of the world, if for any reason this gets disabled such as a blow to the head from a cushion you will see the real world. Basically it’s full of cloud unicorns, wooly pigs, eight foot high rocking horses, purple hills and everyone is naked and called Derek. ‘D’ controls your hand movements, it’s this one that keeps your arm in check from smashing everyone that annoys you in the face, although this can be bypassed again with a glass of wine. To see how uncontrollable it is try this simple experiment and feel your arm raise and about to lash out. Simply stand against a wall and push your arm against it with as much pressure as you can, don’t press your body against the wall just your arm. Do this for two minutes, then step away and relax your arms. This fools your brain into thinking you are being annoyed and your arm will magically raise all on its own. Caution, press for any longer than two minutes and your arm will become annoyed with you and will beat you senseless unless you sit on it for two minutes. Finally ‘E’, controlling the nose it can distinguish subtle differences in smells such as the minute difference between the smell of a rose and horse manure. To understand how it works lets look at what happens when you smell something unpleasant such as entering a public convenience that has just been vacated by a thirty minute sitter who’s failed to flush. First ‘E’ registers a pong that it doesn’t like, it then informs ‘A’ that maybe you don’t need sugar or a biscuit and changes the command to wanting to wretch instead. ‘A’ informs ‘B’ to clean the smell away by causing your eyes to water which also tells ‘C’ that the smell is not of this world and is considered unholy, ‘C’ quickly sends a signal to ‘D’ which raises your hand to your mouth. Unfortunately it fails to inform ‘F’ the gag reflex and you blow chunks through your fingers. Simple. Now you understand the intricacies of your brain, try this final experiment. Pull both of your ear lobes and stick out your tongue at the same time, it doesn’t do anything to you but it triggers a reaction in other people’s brains, try it today at that important meeting or at passing strangers in the street, the results can be quite startling.